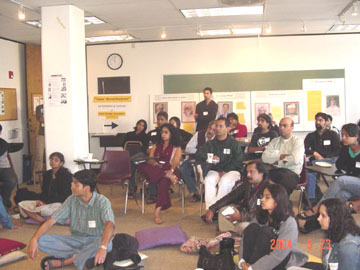 The second South Asian Progressive Conference was held on May 23, 2004 in San Francisco. The conference was attended by over a hundred people, primarily activists from the Bay Area. The focus of the conference was on brainstorming and working to build a strong and vibrant South Asian community. The conference included a workshop on the impact of INS Special Registration on South Asian, Arab, and Muslims. Reshma Yunus, Operations Director of American Muslim Voice and Sanjeev Bery, Field Organizer of the ACLU of Northern California were speakers at the workshop. “The FBI's post-Watergate era internal regulations restricting it from spying on local community groups were lifted; community groups started noticing strange new people showing up at mosques - increased xenophobia against Muslims and those believed to resemble Muslims,” Mr. Bery said. Mr. Bery continued, “then, a year after 9/11, the federal government implemented National Security Entry-Exit Registration System (NSEERS) program.” NSEERS’ (also known as “Special Regi stration”) purpose was to track and register male foreign nationals over the age of 16 from following countries: Afghanistan, Algeria, Bahrain, Eritrea, Iran, Iraq, Lebanon, Libya, Morocco, North Korea, Oman, Pakistan, Qatar, Saudi Arabia, Somalia, Tunisia, United Arab Emirates, Sudan, Syria and Yemen. Other countries were subsequently added. Ms. Yunus discussed some of the call received at the help-line that AMV’s Executive Director, Samina Faheem Sundas, had set up to provide information and education about Special Registration. She said that thousands of people who went for voluntary Special Registration were detained, and sometimes deported for simply for lack of documentation, sometimes involving errors that registrants or their immigration lawyers weren't aware of - some detained/deported. “About 13,000 people were detained during the Special Registration process and many of those were deported. Some registrants wrongly told they had no right to counsel, or were denied right to attorneys - some not given information about where they were to be detained or deported. Many families were impacted, men, women and children,” she said. Both speakers went on to say that special registration was not adequately explained to those required to register. Ms. Yunus related an incident whereby Ms. Samina Faheem Sundas had been told, by an Immigration and Naturalization Services (INS) representative, even a comatose patient was require to be registered. Many Bay Area community groups like Alliance of South Asians Taking Action (ASATA) and Friends of South Asia (FOSA), and American Muslim Voice (AMV) and Blue Triangle were involved with community education on Special Registration and had a presence at INS facilities during the registration process. Special Registration partially ended in fall 2003. The pressure of community groups around the country helped in ending the program by creating noise and elevating debate on the program. Mr. Barry said that the CLEAR Act would require local law enforcement to enforce immigration law - if passed, would drive a wedge between police departments and local immigrant communities. This law could make victims of domestic violence hesitant to call the police for fear of possible repercussions from the Immigration Department. He urged participants to take active measures to lobby senators and congressional representatives to oppose the CLEAR Act. Both speakers emphasized the need to be involved and active participants in the community at large to break down barriers of mistrust. Anirvan Chatterjee of www.bookfinder.com contributed to this report.